The moment I touched this calcite focal bead I knew I wouldn’t be able to put it down. 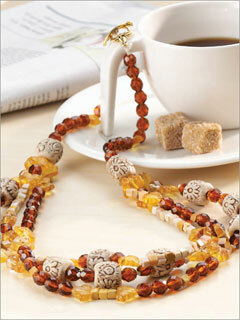 Luckily, there were strands of oval faceted calcite beads hanging on the walls at the store. I was sure I’d have no problem using them. On the contrary, it took a long while for me to design a necklace with the calcites mainly because nothing in my stash worked with their neon green color. What exactly can match up with neon green? Several months later, I found my answer. A bag of amethyst rounds! To hold the big focal bead in place, I chose a thickset sterling silver pendant slider. Bali sterling silver rounds and a toggle clasp completed the set. To make the small amethyst beads coordinate with the rest of the elements, I created a three-strand deal gathered into Bali SS cones at the toggle. Dangling amethysts over and under the focal bead fine-tuned the design. Every creation needs a name. A name is better than a description. A descriptive name is best. 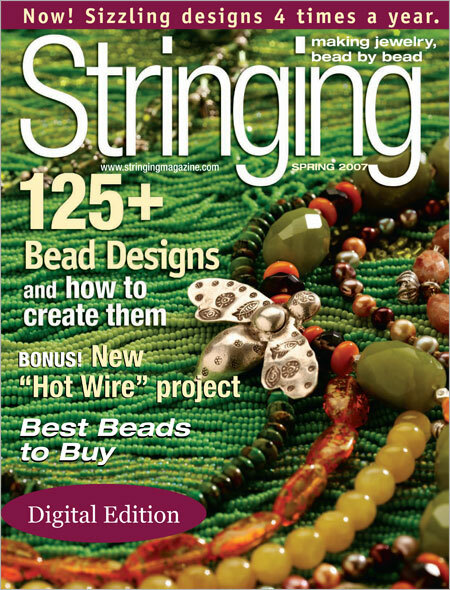 “Grapevine” was featured in Stringing Magazine Spring 2006. 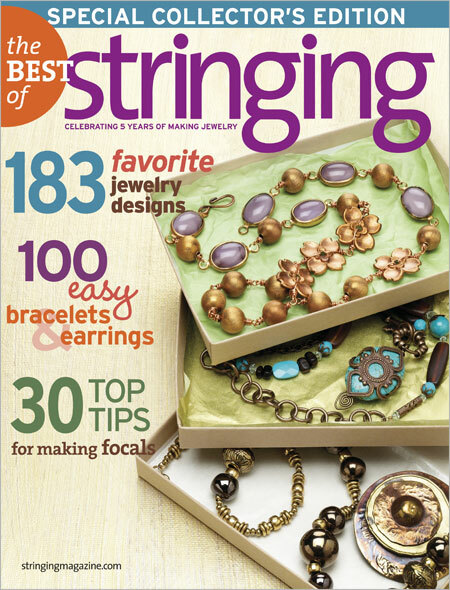 For the Stringing Spring 2006 issue, the editors sent out a color palette as inspiration for the contributors’ submissions. One of the color combinations in the palette that caught my attention was the peach orange and lime swatch. I had some pinkish leaf-shaped glass beads that I imagined would look great as dangles. Of course, peach-pink crystals and gold-filled chain and findings would all match. And naturally, the design had to be dainty. Unlike my other designs that evolve as I play around with the beads, this one I had to sketch first. The placement of the beads had to be precise; the dangles have to hang nicely and lay flat. And the accents must be at the right places. I chose carnelian, aventurine, and rose quartz rounds as accents. This piece may have been influenced by other home arts my mother taught me, like embroidery, crochet, and weaving. Art is art; creativity draws from exposure and immersion. I went inside a bead store with a clean slate. I said I will look for a focal bead and see where it takes me. I saw these interesting grayish ceramic beads that had irregularly shaped black markings on them. I grabbed some discs and a few cubes. With the ceramic beads in my hand, I wandered about the store looking for matching elements. I ended up at the seed bead section and picked up tubes of green and gray matte seeds. When I got home, I gathered some silver rounds and a toggle clasp and went to work. The design came easily once I had all the elements on my beading mat. Now what to name the piece. Because the ceramic beads and the overall color theme of the necklace reminded me of olives, I called it “Olea europaea” — the scientific name of the olive. I distinctly remember being a tad uncomfortable about the heftiness of this necklace because I’ve always favored light and simple designs. But I guess it’s okay to explore outside my comfort zone every now and then. I started with the curly shells as the focal beads. I had some heishi shells as well as tube shells in my stash, so I thought putting them all together would make sense. 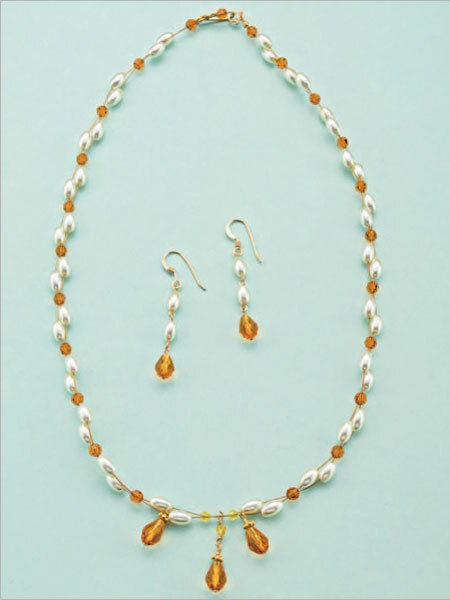 Smooth Swarovski pearls in colors taken from the shells (green, gold, cream) provided the contrast that balanced the design. I chose gold beading wires and let them show through the gaps of the curly shells and double strands of pearls. Mother Nature gives us a wide range of materials to create beautiful jewelry. We just need to pay attention. One of my first tries at wire wrapping is this piece I call “Avalon.” My brother said it looked Persian/Indian. I created this back in June 2005. I was never able to use it until Feb of this year, as an accessory to my attire for a Star Wars wedding. My costume was a takeoff from the blue dress worn by Breha Organa, the Queen of Alderaan and stepmother of Princess Leia. The costume had a veil and it needed a pendant to hold the front ends together just above the knees. I tried looking around for pendant beads but this old wire-wrapped moss agate piece fit the bill perfectly. Sometimes it takes years for a piece of jewelry to do what it was meant to. 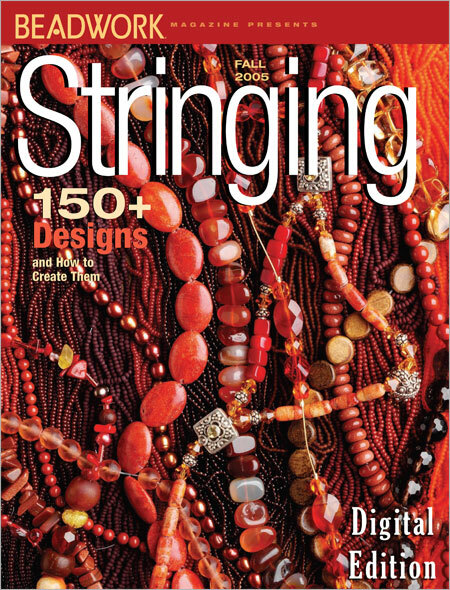 My carnelian cubes bracelet was published in Stringing Spring 2006. 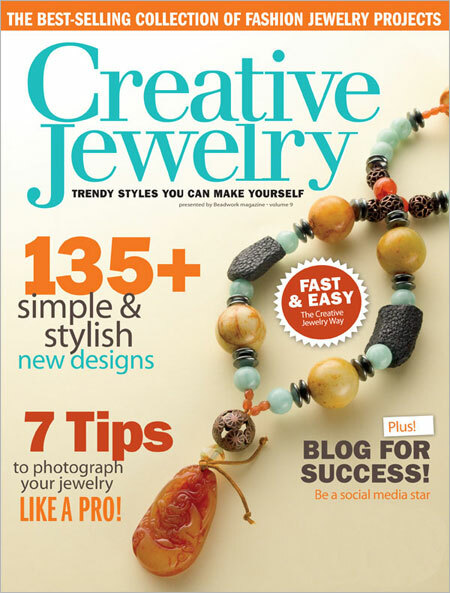 Imagine my joy when I saw the bracelet on the subscription slip of the Winter 2006 issue of the magazine! Naturally, I framed the bracelet with the subscription slip. Who knows when something like this would happen again? Framing the bracelet would mean I wouldn’t be able to use it anymore. I love the smooth and cool feel of the carnelian stones, so I went ahead and made another one — not an exact duplicate but close. Which I ended up giving away when I went to Manila last February. Well, I can always make yet another one — not an exact duplicate but close. The original piece will forever be the original. 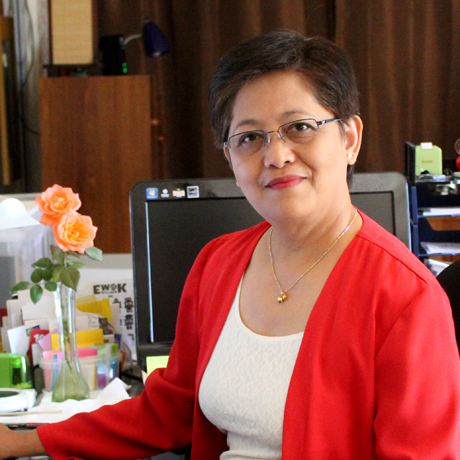 A duplicate, no matter how faithful to the original will always be a duplicate. 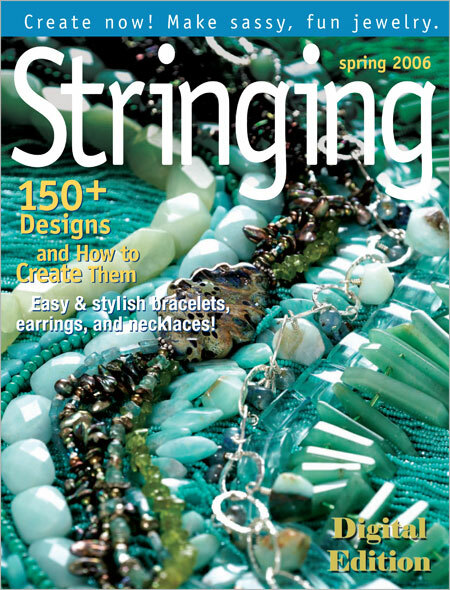 This is the other necklace that Stringing published in their Fall 2005 issue themed after the four elements, earth, water, fire, and air. My Smoke On The Water piece was for, yes, water. I was so thrilled that this necklace was selected because then all the time and effort I put into making it paid off. When I imagined the design, I had no idea how many dangles I would need to compose the frill effect beside the opalite stones. But I knew I had to make several so I started doing that first. The blue and white crystal frills needed to be just the right number — not too few, not too many. I have to admit, I restrung this necklace several times to get just the right volume of frills. At times, building jewelry is much like cooking. You need to prepare all the ingredients first, patiently and meticulously, before you can put them all together in one step to complete the dish.